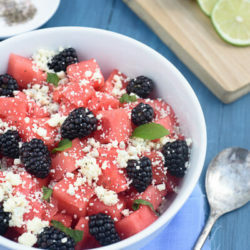 This summer watermelon salad with blackberries & blue cheese might sound like a strange combination but we top it with a splash of honey and lime juice. It's weird sounding but magical tasting! Toss all ingredients except honey and salt and pepper. Taste and add salt and pepper and honey to desired levels. Top with mint leaves and a sprinkle of extra blue cheese if desired for presentation.